Destination weddings have become so popular around the world that it doesn't come as too much of a surprise to us when friends from the UK decide to tie the knot abroad. Good food, fine wine, the chance to explore somewhere new and well, let's face it, almost guaranteed better weather - what's not to love?! 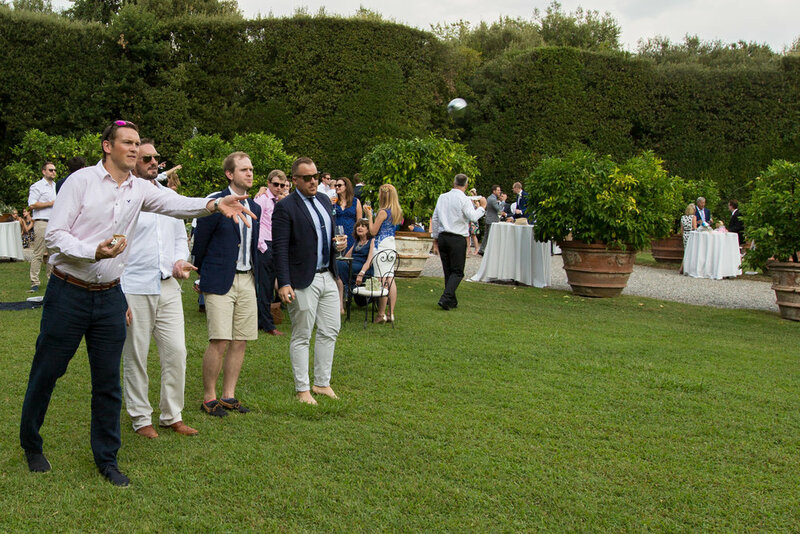 Most recently we were invited to a wedding which took us through Tuscany to a villa in the rolling hills above the medieval town of Lucca. On the afternoon of the big day we boarded a bus for the short ride to the venue, sweeping down the grand driveway of the estate of Villa Grabau, built on the ground of a medieval village and fortress no less, arriving in a garden full of fruit trees, fit for a film scene, to await the bride's arrival. And there, beneath the Tuscan sun, our friends recited their vows and became husband and wife. Canapes and drinks were served in the gardens above the main house - and when I say garden, imagine a park! Boys played boule while girls gossiped. Some took the opportunity to beat a bit of lingering jet lag while a guitarist strummed in the background. The happy couple nipped off for photos while the rest of us drained the bar of prosecco and entertained ourselves with the Photo Booth. As the sun set the wedding breakfast began in the most beautiful barn with vines cascading through the ceiling while twinkling lights illuminated the grounds outside. A delicious dinner was interlaced with entertaining speeches followed by a boisterous attack of the dance floor. Chants of "one more song" rang out as the unyielding staff pulled the plug on the DJ and the party continued on the bus journey home. Congratulations Sig e Signora Delaney!